Founded 29 years ago, Profile 22 Approved Window Contractor Polar Windows has a strong commercial division and works with some of the biggest names in the construction industry. One of Polar’s clients, North Midland Construction, appointed it to supply and install the PVCU windows required in a £24 million project to build accommodation for 735 students at Sheffield Hallam University. While aluminium windows were specified for the building’s street facing elevations in order to meet planning requirements, Profile 22’s high performance Flush Tilt & Turn Windows in Smooth Anthracite Grey were specified for the internal courtyard. Purposely designed for medium and high rise buildings, the sash on the Flush Tilt & Turn Window is neatly positioned inside the frame of the window to create an elegant and sleek ‘flush’ appearance that means it is a cost-effective alternative to aluminium. Polar Windows use of the Flush Tilt & Turn Windows on the internal courtyard elevations meant that North Midland Construction was able to value engineer the project and deliver value back to the client, Host. Profile 22 was one of the earliest UK based and owned manufacturers of PVC-u window systems and grew rapidly in an emerging market. Since then we’ve remained at the forefront of PVC-u window design and manufacture. We’re still based in Great Britain – in Telford, Shropshire – where we own one of the UK’s most advanced plants for the extrusion of PVC-u profiles. 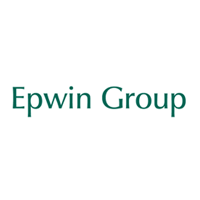 Epwin Group (LON:EPWN) is one of the UK’s largest manufacturers and suppliers of PVC windows, doors and fascia systems with some of the best known manufacturing and service names in the sector.